Hips, trips, training and getting kids outside! 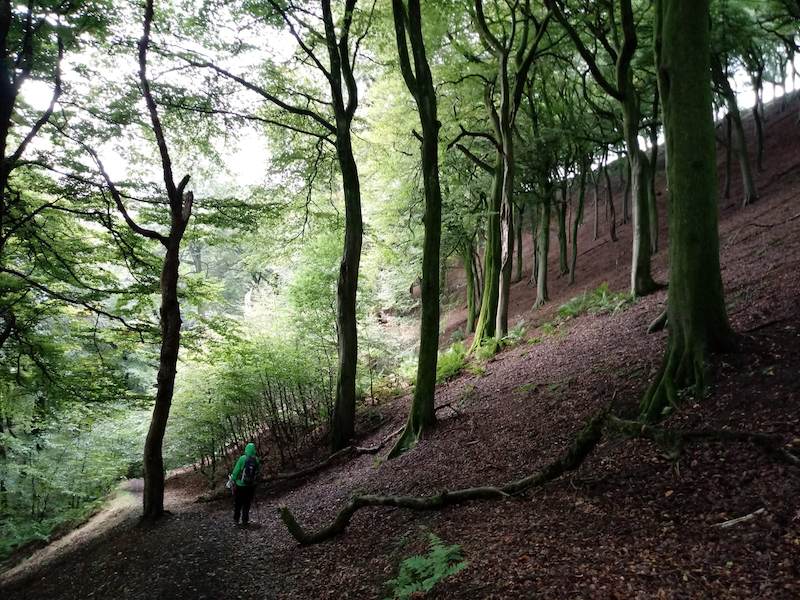 I recently walked two stages of the Calderdale Way with a friend, over a weekend. 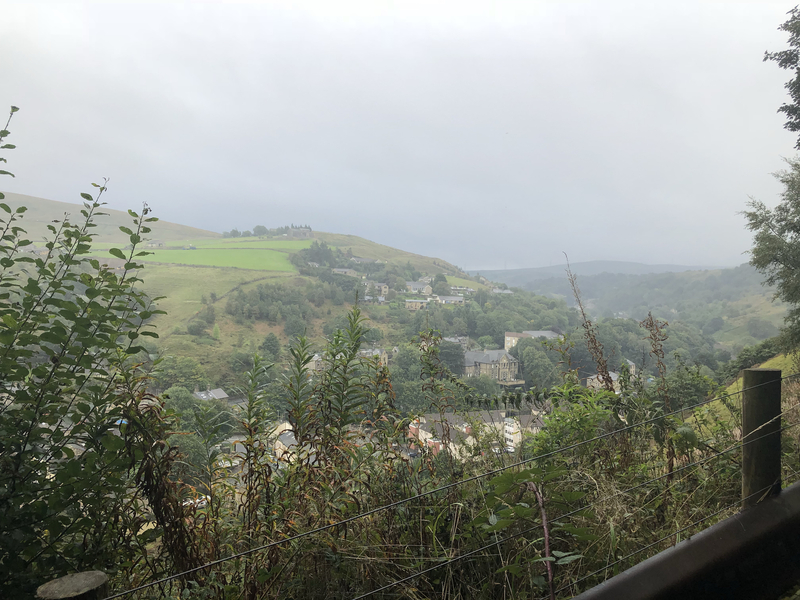 In my last post ‘Calderdale Way Part 1’, you left us at our overnight accommodation tucked up in PJ’s after a pint and meal. We woke up to more rain, well I say woke up, we had been disturbed during the night by many drunks passing the pub where we were staying. I actually hobbled out of bed comedy style at first but once I got moving the stiff muscles eased a bit. My boots hadn’t dried from the day before and their trip in the bog, so it was feet in freezer bags again. Our walk for this stage would be shorter than the day before and we would walk from Todmorden to Hebden bridge. This stage at the beginning was hard not least because of the distance walked the day before, but because you start by walking a steep hill with hairpin bends. 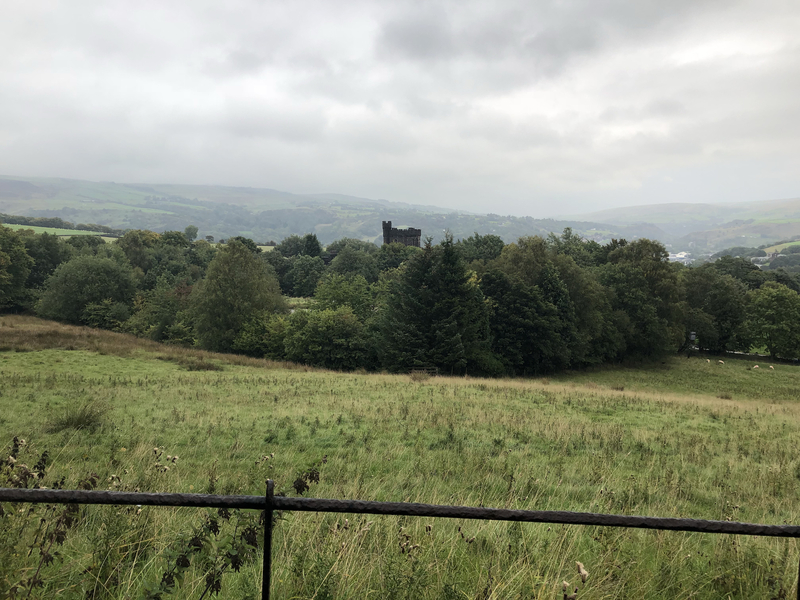 The height gain is quite quick and as you reach Dobroyd castle you are high above Todmorden. The view was shrouded in mist and we were already drenched, the rain intensified just as we were stood on the open moors. 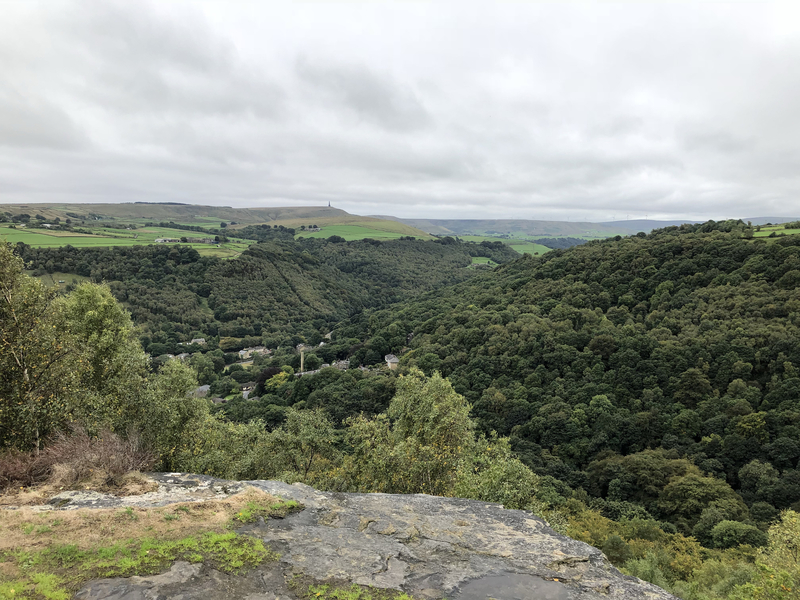 Our walk took us high up onto moorland and then back down through steep woodland paths, emerging now and again to civilisation and then back up onto the moors. 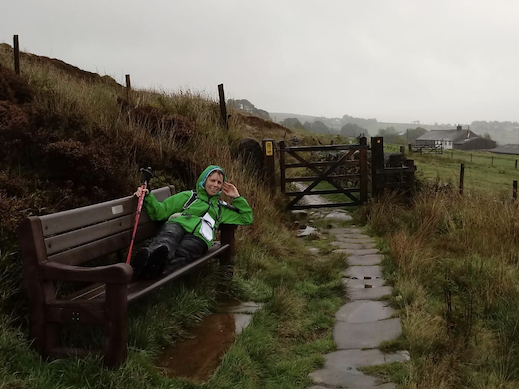 We were tired and drenched, brain fog getting me confused now and again with some of the walk instructions, but we found our way and for the majority the footpath signs were easy to see and follow. There was just one farm that had looked to have done their best to discourage walkers from using the footpath. There were many moments of delirium and hilarity too, despite the weather’s best intentions to dampen our spirits. I spotted a bench at the side of the footpath, obviously placed there to enjoy a fabulous view. Apart from we couldn’t see it! For a laugh I decided to lie down across the bench. I think my friend thought I had completely lost it at that point! It was then even funnier because of my stiff muscles and with wearing my backpack, I couldn’t get up!! I was cheered up at another really tiring moment by a flying frog. Concentrating where I was putting my feet, or so I thought, I was marching along a footpath and also using my walking poles. Suddenly something came flying up towards me and landed on my leg. For a moment I thought it was dog poo and then as it moved I absolutely screamed the moorland down, you might have heard me! It was then I realised as the poor thing flew off, it was a frog!! Having stopped screaming and jumping around I found my friend in hysterics taking photos, I then couldn’t stop laughing and we were nearly crying as we set off again. You see, walks aren’t boring! 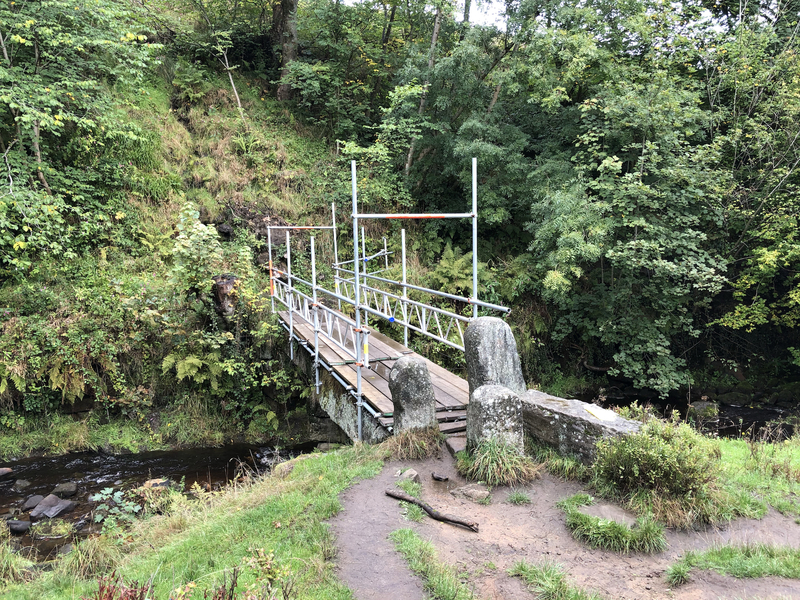 The sun came out late afternoon and even the ancient rickety Hippins bridge, being held up by scaffolding, didn’t stop us and we made good time. It was nice even momentarily to have a nice view to look at. 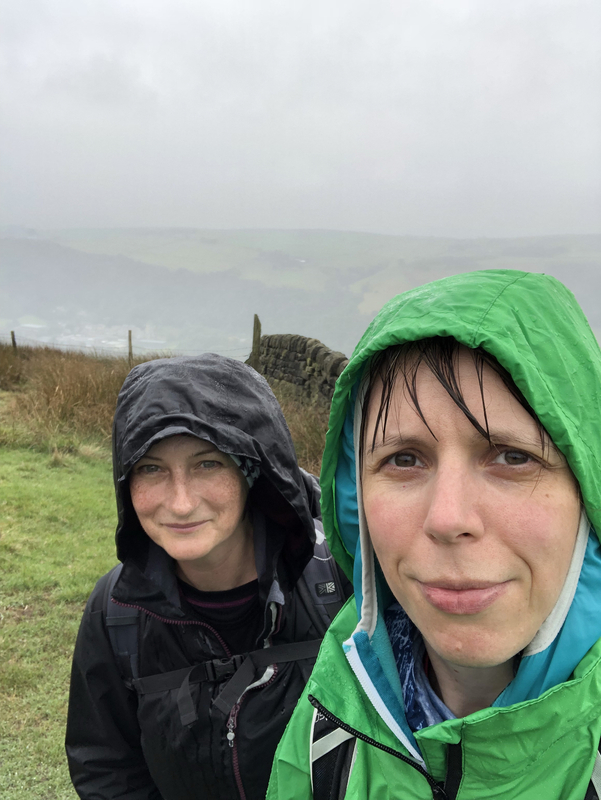 We made it to Heptonstall, the tradition end to this stage of the walk and decided to plod on instead of waiting for the bus to Hebden Bridge. This felt like the longest part of the walk, the sun had come out now and I was really tired. It was all steep and downhill! As we walked to the train station of Hebden bridge we waited to cross the road, and yes the bus we could have got sailed past us! Safely at the train station we waited to be taken home. We had walked approx. 28 miles in one weekend and half of the Calderdale way. What’s more I hadn’t had to bail out and call for a hubby rescue! I can’t wait to do the next two stages but with autumn setting in and sunset getting earlier and earlier we might have to wait till next year. We used Paul Hannon’s book ‘Calderdale Way’ to help guide us along with OS21 L map and the OS map app. The footpaths are also well finger posted. Stay safe if you’re planning your own long-distance walk. 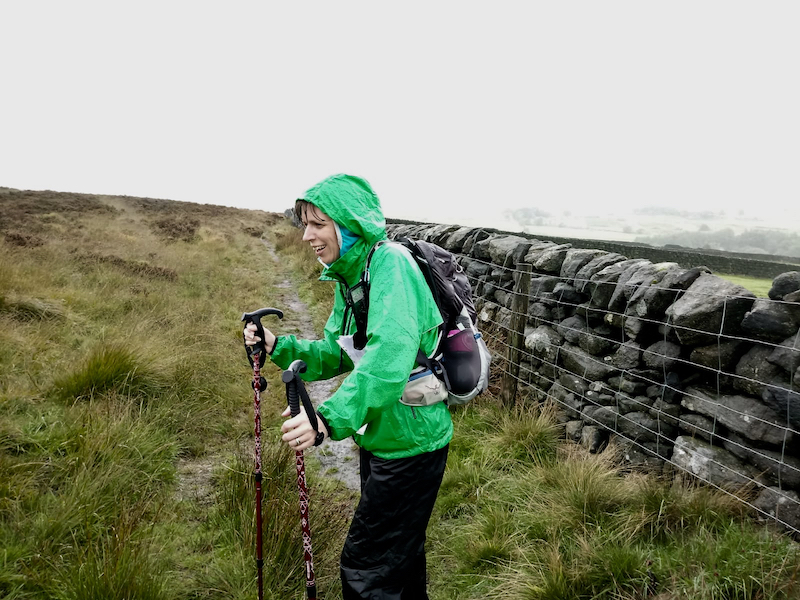 Take the appropriate kit, first aid kit, plenty of water, snacks, head torch, waterproofs etc. Tell someone your intended route and have an escape plan. Have you walked the Calderdale way? Encountered any flying frogs? Let me know in the comments. Thanks to my friend E for coming with me and for the use of some of her photos. This sounds like a great adventure in spite of the weather and noisy drunks. I have those moments of delirium and hilarity pretty often too when the weather is really bashing me. Thanks for joining us on #adventurecalling. We’ll back open for new posts tomorrow morning. Yes, wet boots are horrible! falling in bogs should be avoided at all costs. Conquering a mountain and tote giveaway! Loving this winter…maybe a few ideas for your Valentine! Copyright © 2019 Hip2Trek. All Rights Reserved.